When we analyse the products which the Manipur people use from morning to night, there is hardly any product made by ourselves. A huge amount of money has been drained away from the economically backward state to meet the daily requirements of essential items, said Dr Dhabali Thangjam, MD, Babina Healthcare & Hospitality Pvt. Ltd.
Three new household sanitary products - Yumbi Phenyl, Konshine and Cleanext manufactured by The Lois, Manipur, Leimaram was formally launched today at Manipur Press club. 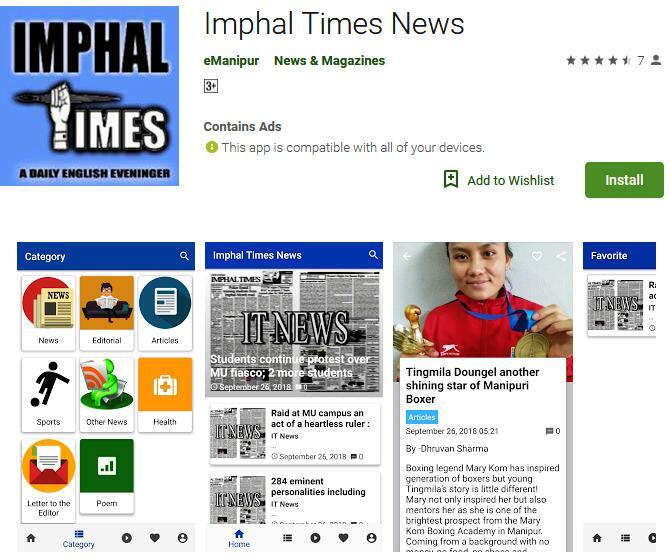 Manipur Times shopping hoisted the programme. Attending the event as Chief guest, Dr Dhabali Thangjam, MD, Babina Healthcare & Hospitality Pvt. Ltd said that the state depends on others for every essential items being used in the state from the morning rise to night sleep, resulting to draining away a huge amount of money from the poor state. If more entrepreneurs are coming up, such money drain can be curbed down thereby boosting up the state economy. While lauding the Lois Manipur for its courageous venture, Dr Dhabali said, competition with the outside brands/ multi national companies which had already dominated the local markets is not an easy task for the local entrepreneurs. “We need to capture the local market first. For it, we need to maintain quality in our products, followed by Price competition plus wide publicity,” Dhabali maintained. He observed that coming out of more success entrepreneurs will also help solve the unemployment problem, the biggest headache of the state. Dr. Keshorjit Sorokhaibam, MIMS, MU, Business Adviser of Manipurtimes Shopping who graced the function as president said the biggest challenge the local entrepreneurs in the state is marketing. Almost costumers want the ‘best quality brand with the cheapest price’. Success of local entrepreneurs depend on the people of the state. We often talk of patriotism or nationalism, but no one is ready to support the local entrepreneurs and use the products made by them. Cooperation and interdependent among us is the need of the hour. If all the people in the state are ready to use the locally made products, our entrepreneurs who are facing market problem will succeed in their venture. Local entrepreneurs should not be considered as profit making. The thing which we should value is their “service”. When we support them, they will contribute to the state after sometime, Dr Keshorjit said adding that Entrepreneurs are the parameter which decide the national development. Naorem Prabin, IAS DC Imphal west said lauded the local entrepreneurs for their venture against all odds. He advised the local entrepreneurs to maintain quality in their products so as to attract more costumers. Local entrepreneurs may face hurdles in their initial stage but they will enjoy the fruit of such hurdles someday. When the “Make in Manipur” venture is successful, the state will no longer be poor, he said while urging the people to support the locally made products. Regarding the demand for reservation of seats for the indigenous people while contesting election in the 8 Assembly constituencies of Manipur, the Kangleipak Students’ Association (KSA) today stated that government has silence to all the agreement it reached with the KSA. “We will now continue the agitation until the demand are fulfilled”, a statement signed by N. Chetan, President of KSA said. The Chief Minister of Manipur N. Biren Singh had assured the representatives of the KSA to take up all the needful in filtering out the illegal migrants from the voter lists of the Eight Assembly Constituencies viz. – Thangmeiband, Sagolband, Uripok, Kangpokpi, Sugnu, Bishnupur, Wangkhei and Jiribam and also assured to urge the central government for reservation of seats in the said constituencies for the indigenous people of the state. the Chief Minister also assured the KSA to direct the DCs concerns to look into the matter within three months during the agreement reached on August 25 of 2017 however, even after a year nothing on the issue has been seen taken up by the government, the KSA statement said. the demands of the KSA are reservation of the mentioned 8 assembly constituencies for indigenous people while constesting for election , to set up a commission for update of the NRC, to enclose a provision that the Citizenship Amendment Bill 2016 will not be implemented in North Eastern States, to remove the Angami, Ralte, Sema, Simte, Sute from the ST list of the state and to replace the so call Kacha Naga, Any Mizo and the any Kuki tribe by the name of the community. The statement further said that Article 29 of the Indian Constitution guarantees preservation of culture of the minority. However no authorities are seen taking the matter seriously as the present day Manipur is being engulfed by the outsiders. In Article 21 (1) (d) (e) all citizens of the country are guaranteed the right to free movement in any part of the country as well as right to residence. However, as per article 19 (5) of the Indian Constitution the state can make laws for the interest of its people. The KSA questioned the government on whether it is the need of the hour to frame a legislation for protection of the people of the state. As per the “Representation of the people Act 1950” voters registered can be done in three criteria. The voter should be a citizen of India, should be 18 years of age and should be from the assembly constituency where he or she is being registered. However due to insincerity of some people who are taking advantage of the condition voters are added from backdoors which result the rise of outsiders in Kangleipak, the statement said. It added that what is fearing most is the statement of Minister of State , Home Govt. of India Kiren Rijiju during monsoon session of the Parliament on July 26, 2018 at which he stated that all those Hindu Bangladesh who entered the country till 2014 will be considered as Legal and the statement by the Chief Election Commissioner on August 1 regarding the NRC of Assam in NDTV which he stated that even though if a person is included in voter list no matter he comes under the NRC or not he can exercise his franchise created apprehension to the indigenous people. The KSA said Manipur need to formulate a process like NRC to filter out the illegal migrants and added that the KSA welcomes the statement of the vice president of BJP Om Mathur which stated that NRC will be implemented across the country. It said that the KSA had already demanded to establish a Manipur State Population Control Board (MSPC). The KSA also expressed apprehension on the Citizenship Amendment Bill 2016. The KSA statement also elaborated on the condition adopted by the Meghalaya Govt. for protection of its citizens. Socialist Students Union of Manipur (SSUM) in a statement today said that Nongthombam Sanahal, who hold the post of President of the students body had already relieve from the post of the president after his family member requested the students’ body on August 10 and following his removal, Vice President Saraijam Yaima has been taking charge of the President. The SSUM statement said that the matter relating to Nongthombam Sanahal had been made public through media on August 15 by announcing that Nongthombam Sanahal has no relation with the students’ body. It appealed the government not to connect with the student body while arresting him to malign the image of SSUM. The SSUM statement said that the allegation levelled against Sanahal by the state government will be looked upon to find out the truth. If the allegations are set up one then SSUM threaten serious democratic agitation besides taking the help of Judiciary. Personals of 12 Assam Rifles arrest two drug peddlers along with 4960 piece of WY tablets at Khudengthabi yesterday afternoon. Report said that the drugs were hidden in the seat of a two wheeler Kenbo bike where the two drug peddlers came from Indo Myanmar Border town Moreh towards Imphal. The two drug peddlers are identified as Jangkhongam Touthang (52yrs) , S/o: Jongkhongam Touthang from T. Bongmol Village -Tengnoupal District. Both were reported handed over to Moreh Police station along with the seized drugs for further investigation and procedures. The one basic thing that could make much of almost everything much easier, simpler and smoother, yet seemingly impossible to accomplish is the act of coming clean. It would indeed take a much greater strength of character to own up to our mistakes and shortcomings, and still greater willpower to refrain from deliberately committing acts we consciously know is wrong and false. The few fortunate ones who have the grit and will to transcend these urges are acknowledged and respected, even revered. On the other hand, a new breed of “Go-Getters” who would not stop at anything to achieve their goal is on the rise- the pressures of present day society helping in developing and pruning such mindset to perfection. They are the restless, hyperactive and aggressive ones who do not cater to emotions and aesthetics. Modern parents and guardians are increasingly urging their wards to adopt the letter approach towards life in order to carve out a place in the society that invariably results in a level of respect- respect that again is dependent on the earning capacity, the social circle adopted and living status maintained. Increasing compulsions for security in terms of food, shelter and a step towards a more secure future could be the factors that prompted the collective thinking towards adopting such an attitude towards life. But then, does that justify the adage “All is fair and love and war”? Is our life becoming a daily struggle, a battle- if not a war, we are destined to wage every single living day of our lives? Where does that leave us with any room or opportunity for improvement- not the financial kind, but a more rounded and holistic one as a person? The present developments in the society – particularly that of mindless atrocities and lack of considerations that is becoming rampant would be, to a large part, a spill-off of this new approach towards life. Greed takes precedence over everything else, making our lives worse off than when we started. What then could be the panacea for these aberrations that has come to plague our lives of late? The answer lies within us- common knowledge which just needs to be acknowledged, and more importantly to act on. Putting up a façade of make-believe and a show of benevolence and righteousness will not absolve anyone of the crimes and wrongs. This is of utmost importance for everyone, and more so for those who are donning the role of public representatives. Concepts like beauty, peace and harmony can only be experienced if we can rise above our petty urges and look at life- that of ourselves and the ones around us in a different and totally new perspective- one that does not have anything to do with wealth, power or fame. But how does one explain these “abstract” concepts, even after knowing them to be true, to someone struggling to earn a square meal on a daily basis? Aren’t there adequate schemes and programs to alleviate these basic sufferings being borne by a majority of the people in the State? How do these people who are consistently trying to find any menial job just to earn enough to eat come to know of these schemes if they are not informed, and more importantly, assist them in getting their fair share? Who would not want a little extra, even inspite of having more than everything they could possibly ever need in life? The best persons to validate this observation will be in the performance of those in whose hands are the reign of power and affairs of the State. “The earth has enough to satisfy man’s needs but not man’s greed”: Mohondas Karamchand Gandhi. In the major world religions, there is someone who is regarded as the great leader or teacher of that religion. Some of these teachers are called Founders, Son of God and Prophet of God depending on their efforts for the development of new faith. There are also a few religions where they regard themselves as the God, who was reborn in humans from their sins. The Buddha however, the founder of Buddhism is an enlightened and the fully awakened being who is neither a god nor a prophet of god, nor a messenger but a compassionate teacher who taught compassion, love, good will and showed the way to achieve ultimate happiness, unborn, undying, deathlessness which everyone is capable of achieving, the Buddha-nature, complete silence and inner peace. This is the nature of the mental state that every one of us has a capability to achieve – the state of Buhhdahood – depending on individual effort and perfection. The recent historical Buddha, however, was born in 2635(AD 2012+543= Buddhist era 2555+80) years ago in Lumbani in present day Nepal and lived and died as a human. He had transformed himself from an ordinary human being to supra-ordinary human being through mental training. Buddhism does not put much emphasis on the Buddha’s biography but concentrates on his teachings. Nevertheless, simple collections of his life scattered in the Buddhist scripture suggests that The Buddha’s given name was prince Siddhartha, family name Gautama and was born to one of the leading men of the Kingdom of Kapilavatthu. It is said that he was provided with every pleasure he could desire. He was married at the age of 16 to Yasodharna and at the age of 29 years had a son called Rahula. One night the Prince Siddharttha Gautama walked out of his comfortable life and became an ascetic ‘a holy man’ (brahmacariya) on the quest of finding the way to liberation and to complete inner peace. The scripture suggests that when Prince Siddhartha had a chance to see the world outside the palace life, he saw human life as a cycle of suffering which began with trauma of becoming and proceeded inevitably to aging, illness, sorrow, corruption and death. Realizing this universal fact that no one is exempt from this, he crept away in his 29th year of age without saying goodbye to his wife, his son and his family. It was as though he did not trust himself his own determination to leave palace in search of salvation in case his wife requested him to stay. Further, no one can achieve higher knowledge without sacrifice. Once the Siddhartha left the luxurious life, he travelled in his quest of understanding the true nature of life for six years. The scripture records his quest in different discourses, particularly in Pali scripture that provides detailed information about his practice of austerity during his search, his determination and dedication. The scripture also says that he had strong faith and confidence in finding the goals of his quest. His dedication and determination was firm and unshakeable towards his quest of finding the ultimate reality of nature despite physical difficulties and being abandon by his fellow ascetics etc. As a result of this determination and dedication, after six years of austerity practice his eyes opened wide, ultimate light arose in him and ever since he was known as the Buddha which means fully awakened one, perfectly enlightened, the knower of the world and its condition. The Buddha is not the name of a person but a title of a man who is fully awakened. Buddha from the root budh- means awakened. This, it literally means one who has fully awakened by completely extinguishing all sensual by completely extinguishing all sensual pleasures, (bhaggarago), hatred (bhaggadoso) and delusion (bhaggamoho). After the enlightenment, the Sakyamuni Buddha, the sage of the Sakyaclan, travelled to cities and villages sharing his teaching which was based on social, individual and psycho-phenomenal exercises to human kind. The Buddha continued his journey until he was 80 years of age to share and spread the teaching that offers the path that leads to the end of suffering. The Government of Manipur declared holiday today for all Government Offices and Government Educational Institutions on the demise of Former Prime Minister of India, Shri Atal Bihari Vajpayee. According to a press release issued by Joint Secretary, General Administration Department, all banks in Manipur will also remain closed tomorrow (August 17, 2018) as mark of respect to the departed dignitary. “Sports Week” organized by the Assam Rifles Singhat Battalion in association with the Presbyterian Youth Fellowship (PYF) since August 16 is being underway at Muallam village in Churachandpur district. The Assam Rifled organized the Sports Week with an effort to build friendly relations with the locals and promote unity, peace and harmony in the region by bringing the different tribes together through the medium of sports. The Sports week aims to attract the youth towards sports and encourage the talented players to take up sports as a career. It will be concluded on August 22. Sports items like football, volleyball and goal post nets for the various events were provided by the Assam Riffles. During the week, various events such as Marathon, Long Jump, High Jump, Football and Girls Volleyball are being organised. This year a total of 17 teams from all across the District are participating in various sporting events. The overwhelming participation of teams and huge turnout of spectators during the event has made the event a grand success. Most of the city based scribes are facing various eye related problems, where ten percent of them need urgent medical attention. Over 70 % of the participants in a day long eye screening camp at Guwahati Press Club also diagnosed with losing the power of eyesight. City based ASG Eye Hospital, a part of nationwide super-specialty eye hospitals’ chain that was initiated by eye experts from AIIMS, organized the screening camp today (16 August), where around 50 scribes participated. Senior ophthalmologists Mohammad Dilshad and Balwinder Singh examined the eyes of participants and offered free consultations, where corporate manager Syed Aminul Hussain and relationship manager Debasish Baruah were also present.